(GCFFA): Halfway through the Grand Cayman Flag Football Association Dart Women’s League, close-scoring games prove that each team is becoming increasingly competitive and privy to their opponents’ strengths and weaknesses. Last Saturday’s games saw the undefeated Domino’s Pizza Wolverines narrowly win over the Androgroup Killa-Panthers, with a final score of 13-6; and for the first time this season, there was a tie-game between the Lone-Star Jager Monsters and Hammerheads Lady Sharks, at 12-12. The phrase ‘defense wins games’ is proving to be true for the Androgroup Killa-Panthers, who, in the past two weeks, have managed to halt the offensive progress of the top two teams in the league. Although the Killa-Panthers didn’t win their last two games, they did manage to stay right on the heels of the Wolverines and Lady Sharks, keeping both teams from accomplishing high-scoring games. In the game against the Wolverines, the Killa-Panthers’ Christina Pineda and Lisa Malice exchanged quarterback duties. Pineda completed eight out of fifteen attempts, with two interceptions thrown. Malice was on target with six out of eight passes completed. Caron Murphy with three. In the second half, the Killa-Panthers became the first team to score on the Wolverines this season, when Natalee Dyke ran a handoff into the end-zone, bringing the team within six points of the Wolverines, and fuelling their momentum. Janique Samson had most of the action on defense, and a season high, with five tackles and an interception. Becky Coe, Gillian Roffey and Phillipa Knights each had two tackles, and Dyke added to the Killa-Panthers’ defense by sacking the Wolverines’ quarterback twice. For the Wolverines, the chemistry was simply not flowingon the offensive line-up. Quarterback Antoinette Lewis was not her usual self, completing only twelve of twenty passes, including one for a touchdown. In an attempt to spark up the Wolverines’ offense, Dionne Whittaker stepped in with one out of five passes completed, making an important touchdown throw that brought the second score in for the Wolverines. Alexandra Terry also completed one of three attempts in the quarterback position. Leading the offense for the first time this season was Jahzenia Thomas with five receptions. Terry, the constant target, had a quiettime on offense with three receptions. Benecia Thompson and Saneata Smith each received touchdown passes and Christsania McLean brought in the extra point. Defense also kept the Wolverines in the game with Alexandria Saintvil bringing in four tackles and one interception. Right behind Saintvil was Saneata Smith with three tackles and Shinette Rhoden also flew out of from the safety position to intercept a ball in the mid field. Agueda Broderick also chipped in with two sacks to the Killa-Panthers’ quarterback, while Thomas’ steady rush paid off, leading her to three sacks. 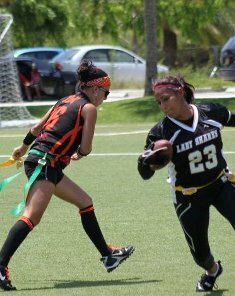 Interceptions and fumbles defined the second game with the Lone-Star Jager Monsters versus the Hammerheads Lady Sharks. In the first half, it seemed as though the Sharks would make mince meat out of the Monsters as they stopped their opponents from barely moving the ball 15 yards down the field; however, the second half showed a different story, as the Monsters made some key plays, managing to tie the game and stop the Sharks from scoring again. Missing their starting quarterback, Christina Hefner, the Monsters opted for rookie player Erica Bosch-Bone to fill in as quarterback. Bosch-Bone completed ten out of eighteen passes, with five interceptions thrown. Michelle McTaggart, who started off the season as the team’s quarterback before moving to receiver, helped out Bosch-Bone with four completed passes out of eight attempts, and one interception thrown. Both quarterbacks spread the ball around, with Kristin Kipp, Melanie Lewis, and Michelle McTaggart each receiving three passes. Renee Thompson caught a high pass from Bosch-Bone in the end-zone, bringing in the first touchdown for the Monsters in the beginning of the second half. Bosch-Bone managed to barely secure a second touchdown for the team as she ran the ball in, with what seemed to be a questionable dive into the end-zone. The Monsters stayed in the game with their defensive stops. Thompson had an excellent game on defense, with six tackles and four interceptions. Christine Bisnauth, Monique Roberts, and Christina Ravdas each had three tackles, and Roberts also came up with an interception. For the Lady Sharks, having five interceptions thrown between quarterbacks Bobeth O’Garro and Ellen Downey killed the team’s chances in the second half. O’Garro completed four out of ten passes, with two interceptions thrown, and made one incredible run past a slew of Monsters’ defenders to bring in the first touchdown for the Sharks. Downey completed twelve out of twenty passes, with three interceptions thrown, and one touchdown pass. Serena Yates received six balls, followed by Lilia Connolly with four. Dionne Anglin and Kathy Miller each had two receptions, with Anglin catching a ball in the end-zone for a touchdown. On defense for the Sharks, Connolly led the way with three tackles and two interceptions. O’Garro, Miller and Keisha Anglin each came up with an interception. Katherine Maw, Maggie Ebanks, and Miller also had two tackles each on defense. During overtime, it looked as if O’Garro’s long pass to Dionne Anglin would bring the Sharks into the lead again, but the ball brushed Anglin’s fingertips and she couldn’t hold onto it for the crucial score. The Monsters were not as successful in their overtime drive to bring the ball near their goal line, and the ending result was a tie-game at 12-12. This coming Saturday, 20 August at the Camana Bay Field sees the Lone-Star Jager Monsters versus the Domino’s Pizza Wolverines at 10am, followed by the Androgroup Killa-Panthers against the Pythons.